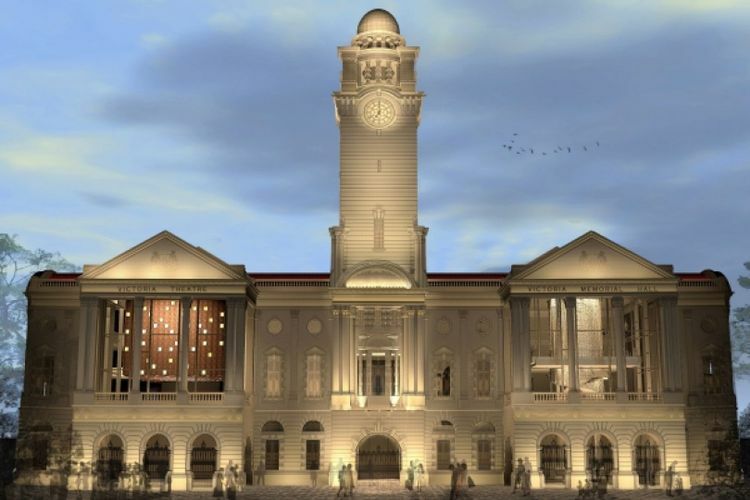 The Victoria Theatre and Concert Hall in the heart of Singapore’s Civic District is one of the most historically versatile buildings in all of Singapore. In the course of its nearly 150-year history, apart from being a focal point for arts and cultural entertainment, this handsome Victorian-era colonial landmark with its distinctive Palladian clock tower, Italianate windows and rusticated columns was once a town hall, hospital and a war crimes trials court. The history of this building is a fascinating one. In fact, you’ll be surprised to know that it wasn’t even originally intended to be a theatre. Designed by prominent architect John Bennett, it actually began life as the young colony’s Town Hall in 1862. The fact that it had two large halls on each of its two floors allowed it to stage concerts. And soon, while it thronged to the footsteps of municipal employees in the day, amateur groups were busy putting on plays and concerts at night. When Queen Victoria passed away in 1901, the colonial government decided to erect a memorial to her long reign, deciding that a public hall alongside the existing Town Hall building would be a fitting tribute. And sensibly, they decided, in the name of continuity, to keep the same architectural style as the earlier municipal building. The new building was christened Victoria Memorial Hall upon completion in 1905, and almost immediately, the Town Hall underwent renovations to turn it into a theatre, with the space between the buildings earmarked for a splendid clock tower. The makeover project (to turn the complex into three different parts) was completed in 1909 when Victoria Theatre officially opened. In the period before World War II, the Victoria Theatre and Memorial Hall staged many concerts, musicals and plays, including a performance by Noel Coward in 1930. It was lucky to have survived intact during the Japanese air raids, and during the Japanese Occupation its strategic location in the city saw it being used as a hospital. During peaceful times, it was also the scene of political milestones, chief among them the launch of the ruling People’s Action Party in 1954. And then in 1962, the original bronze statue of Singapore’s founder Stamford Raffles, which had been standing at the nearby Padang for years, was moved to the front of the building. When the Singapore Symphony Orchestra moved in 1979, the complex was renamed Victoria Theatre and Concert Hall. To preserve the grandeur and allure of the Victoria Theatre and Concert Hall, it will be closed for an extensive two-and-half year renovation, before reopening in 2013.